I was asked by my fabulous doctor to make a cake for her mom’s birthday. 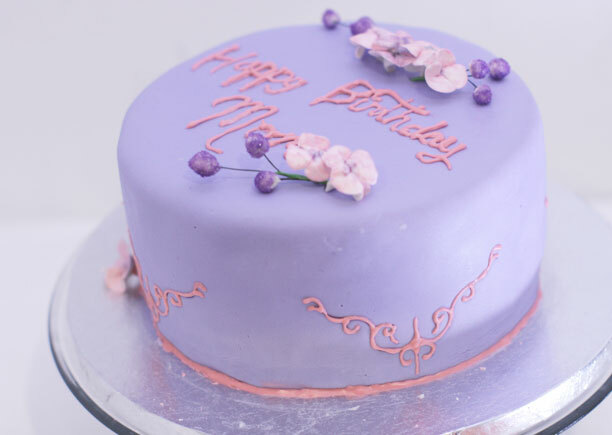 She wanted purple fondant with pink lettering. She also wanted some flowers and a space to put a silver candelabra candle holder she had found. The candelabra had a swirl pattern in it that I decided to mimic on the side of the cake. The one thing she did ask for? “Happy Birthday Mom” written on the cake. Writing in royal icing is probably one of the hardest things for me. I can’t ever get it right. 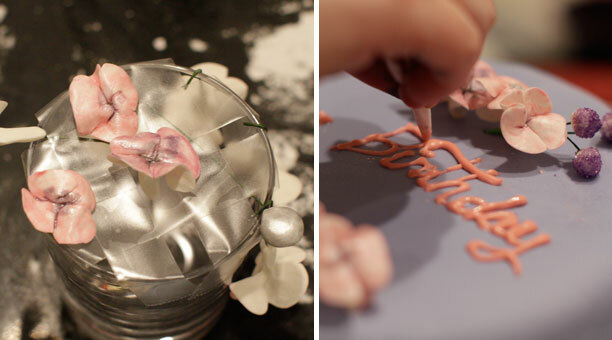 The technique often involves printing out what you want to write on a piece of paper and then tracing over it on the cake so it leaves an indent in the fondant. After that you write over the indent with royal icing with a very fine tip or a cornets (core-neys). Anyway I’m not 100% happy with how it turned out but I will definitely put this on my list of things to learn to do better. I used a similar technique on the side of the cake. I have an impression press from wilton that puts the indent of the swirl in the fondant and then I went over it with royal icing. I really like how this turned out. I also made all the flowers with white gumpaste and painted them with a mix of food coloring, luster dust and alcohol. The small balls are called mimosa and they are balls of white gumpaste rolled in purple sanding sugar. The cake is vanilla butter cake with vanilla icing. There’s a small bit of amaretto and simple syrup on each layer of cake. Wow that’s absolutely amazing. Love the blog. Good Luck!